Wildfowl Videos - Thalassornis Leuconotus White-backed Duck Video - Wildfowl Photography. Appearance - The White-backed Duck has a speckled dark blackish-brown crown and hind neck which also extends down to the dark-brown eye, buff foreneck and sides and cheeks are buff speckled with brown, a white patch at the base of the black hooked beak with yellow blotches, a buff breast with barring, underparts are also buff with barring and upperparts and flanks are buff with broader black barring, the lower back is white but this can't be seen with folded wings, a black rump and tail, pale brown flight feathers, Wing coverts are dark brown with buff and white markings, and legs and feet are greenish-grey. Both sexes are alike. Notes - The White-backed Duck is distinct from other ducks but its tail resembles a Stiff-tail Duck and its call is similar to a Whistling Duck. They are also very good at diving and can stay underwater for up to half a minute. 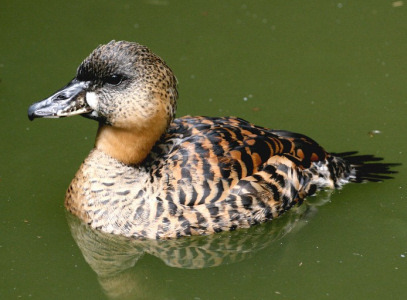 There are two sub-species of White-backed Duck - Thalassornis Leuconotus Leuconotus and Thalassornis Leuconotus Insularis, and the latter is endemic to Madagascar.